The days of soft, “boat-like” Cadillacs made for your grandparents are long gone. 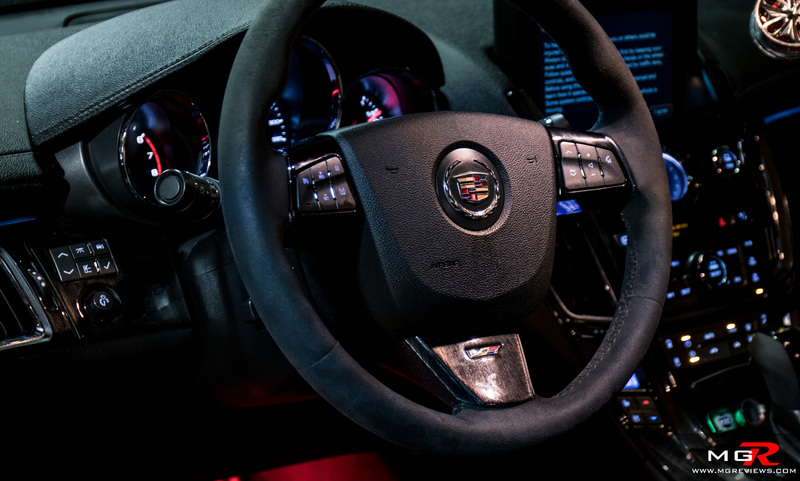 These days Cadillac is trying hard to appeal to a younger demographic by giving their vehicles a “sculpted” look and driving characteristics that would even impress a European. But the biggest thing this particular Cadillac has going for it is the bomb under the hood. 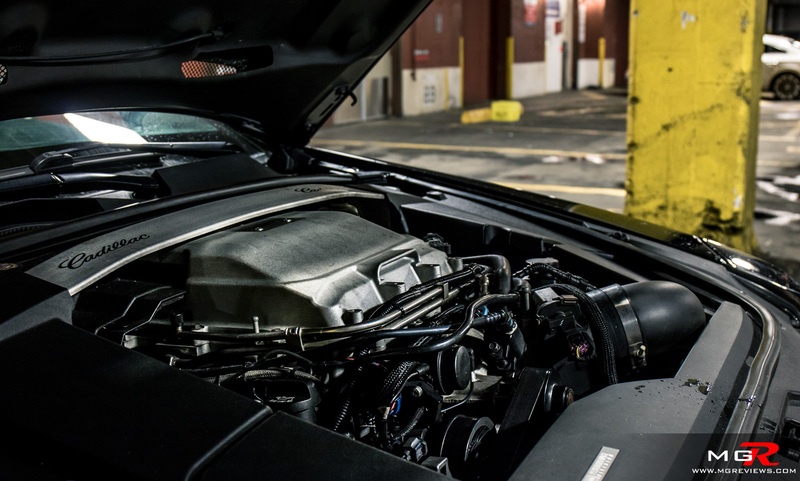 Performance – When a stock Cadillac CTS-V rolls off the assembly line, it comes with a 6.2L supercharged V8 that produces 556 horsepower. For most drivers, that’s plenty of power. In fact at the time that this car was introduced, it had a more powerful engine than the then Chevrolet Corvette Z06. But the owner of this particular Cadillac thought it needed more power. So it now produces around the vicinity of 800hp. To put it into perspective, a modern day Formula 1 car also develops somewhere around the 800hp mark. 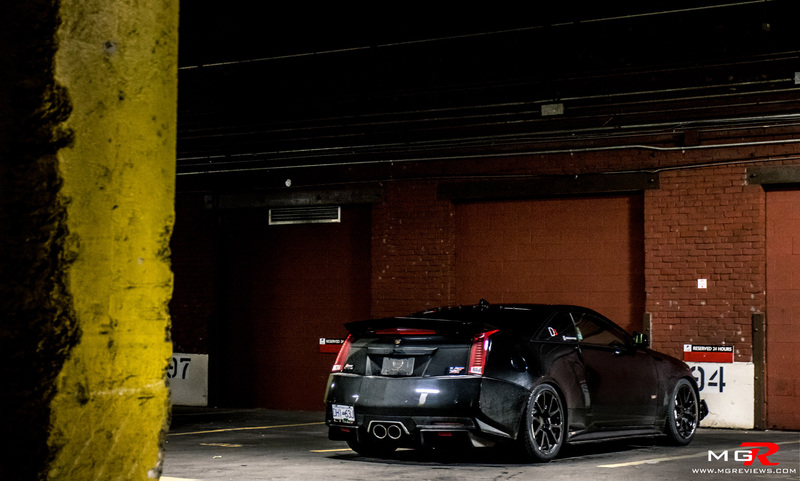 Granted, a Formula 1 car does not weight around 1,900kg like the CTS-V Coupe. But despite its hefty weight, the big Caddy has so much torque and power that it feels like it sheds its weight and punches you in the backside as it accelerates in a straight line. Anything approximately above 2000 rpms and the car just goes and goes and goes. The only thing that’s stopping it from accelerating as fast as it is theoretically possible, are the tires. At the time of reviewing this car, it was a cold and frosty December evening. The car had been fitted with snow tires which meant a lot less grip than if it had been on summer tires with a dry and hot pavement. Because of the snow tires, the traction control light on the instrument cluster lit up like a Christmas tree. But despite the tires, the car could still give you a rude awakening with its ferocious acceleration. When the car is not trying to pin you to the back of the seat, it tries to throw you out of it instead. 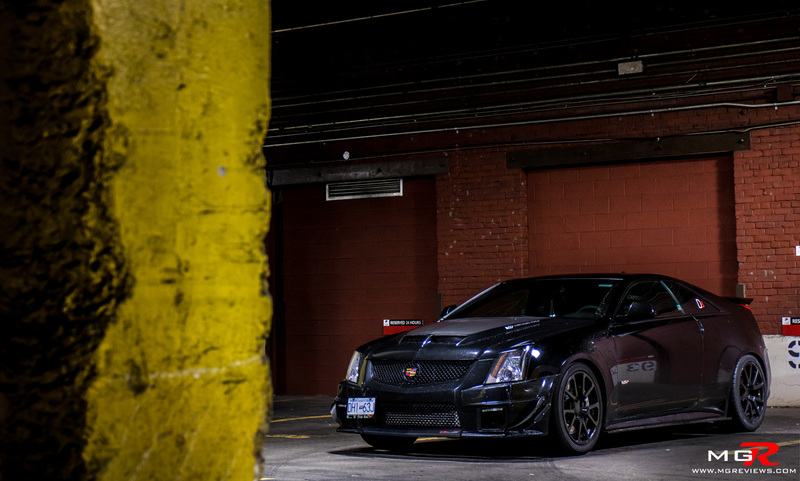 Around corners this second generation Cadillac CTS-V is more composed and eager to tackle a corner without crashing. The steering is precise and feels nicely weighted with an adequate amount of feedback for such a hefty vehicle. 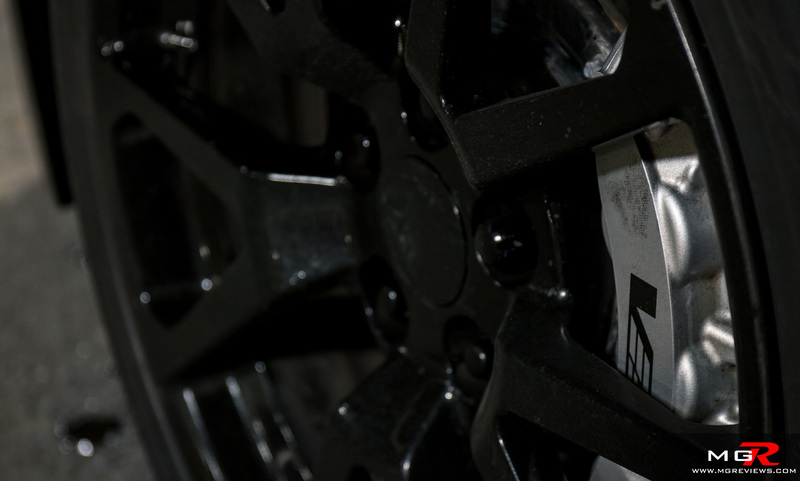 When stopping is required, the standard Brembo brakes still provide enough stopping power even with 800hp and nearly 2 tonnes of weight behind them. However the biggest problem with this car is the automatic transmission. Regardless if it’s in normal drive or sport mode, it is sluggish and lazy when shifting up or down gears. Using the steering wheel mounted shifters is even more frustrating because there is a very noticeable delay between the time you instruct the computer to change gears and the time the gear change actually occurs. For daily driving, the optional manual transmission would be a better bet. Comfort – The owner of this vehicle actually does use it on a daily basis. Despite the way it looks, it is not much wider than an SUV and not as low as something like a Corvette. Driving around city streets is not intimidating in the sense that you may curb the wheel when parking or it’s too low to drive over a speed bump. It’s also surprisingly comfortable. The active magnetic suspension absorbs most of the bumps and potholes that litter city streets while the seats provide the cushion that one would expect from a premium luxury brand. However this car is not without its own faults mostly due to the modifications with the exception of interior space and outward visibility. Legroom is good if the front seats are in the backmost position but then that takes away from rear legroom. Headroom is very tight in both the front and rear seats which is made worse by the addition of the sunroof. Outward visibility is good when looking in the front or the sides but not when trying to look out the back window. All that can be visible when looking in the mirror is the roof of the vehicle behind and the big rear spoiler of the Cadillac. 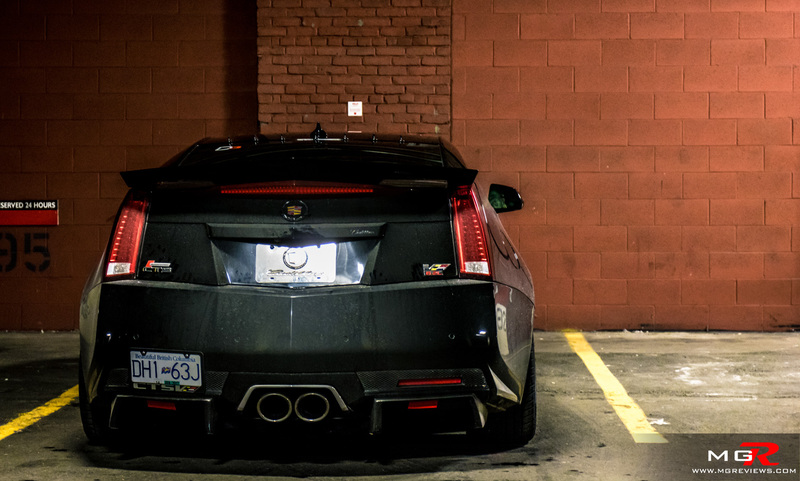 Thankfully the CTS-V does come with a backup camera making for easier parking. Those faults may be overlooked but the noises intruding the cabin due to the modifications cannot be overlooked… or at least it’s very difficult. Firstly is the noise coming from the suspension, specifically from the upgraded bushings on the sway bars. Over the smallest of bumps, it starts squeaking away like a family of mice are living underneath the hood. But that’s nothing compared to the noise from the exhaust. Now I, like everyone else, enjoy the sound of a rumbling V8 but i don’t want it to be shouting like a NASCAR stock car all the time. This is exactly what this car does. The BBE exhaust is unrestricted from the engine back and features large diameter piping to allow the engine to properly get rid of the exhaust gasses from the increased supercharger boost. But it is so loud that you can hear each individual cylinder firing as the car slowly accelerates from a stop. Driving past police officers is also a game of Russian Roulette because you never know when one of them may decide to pull out a decibel-o-meter and measure just how loud (and illegal for the street) the exhaust system really is. You can try to tune out the sound from the exhaust and suspension but it is very difficult especially if you’re trying to have a conversation. Odds and Ends – As mentioned earlier, Cadillac has tried to design their vehicles to appeal to a younger demographic rather than pensioners from Florida. 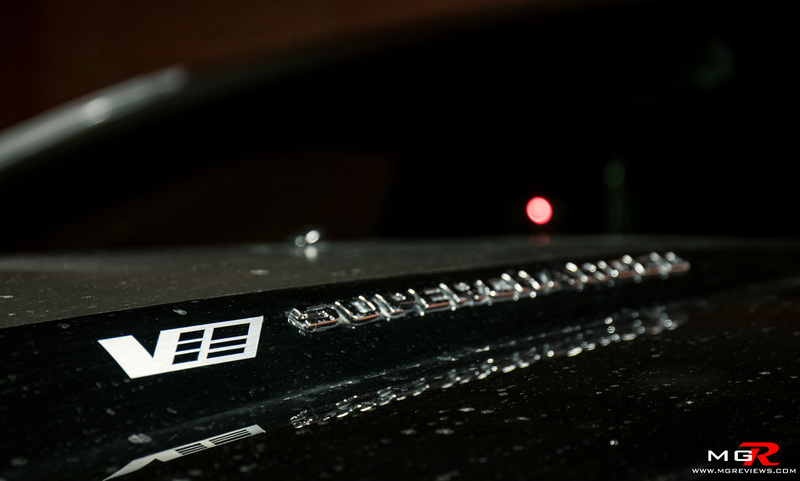 Nearly every panel on the Cadillac is angular and looks as though a ruler was the only tool used by the designer. 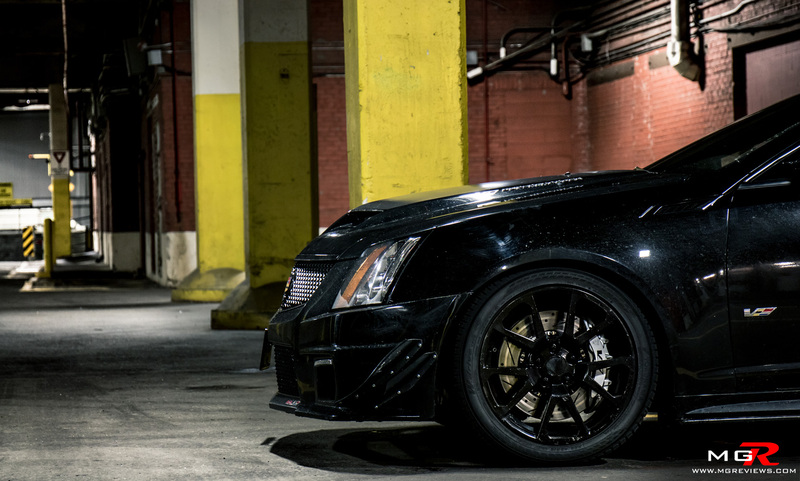 Personally as part of the target demographic, I like the look of the Cadillac CTS-V Coupe. It manages to look striking but not over the top like a Lamborghini for example. 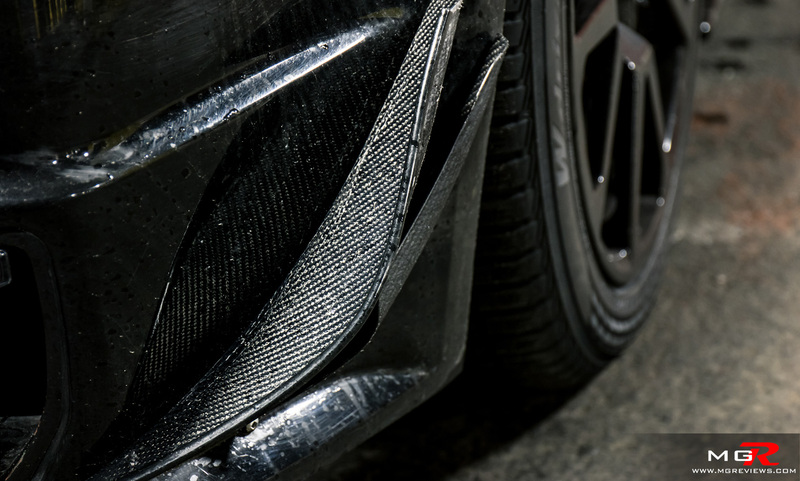 To some the hood and the carbon fiber canards that the owner added may be over the top but to me it looks like as though they belong on the car. As they say, beauty is in the eye of the beholder. The interior however is starting to look it’s age. 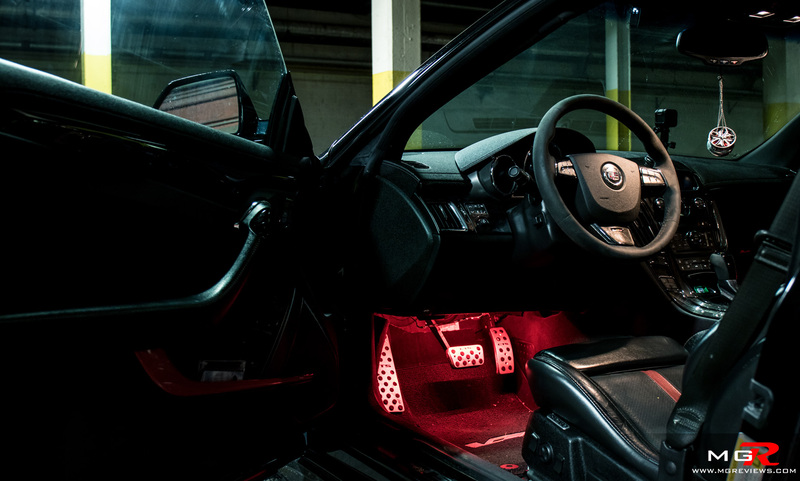 The center console is littered with buttons and a lot of plastics that are not appealing to the touch. 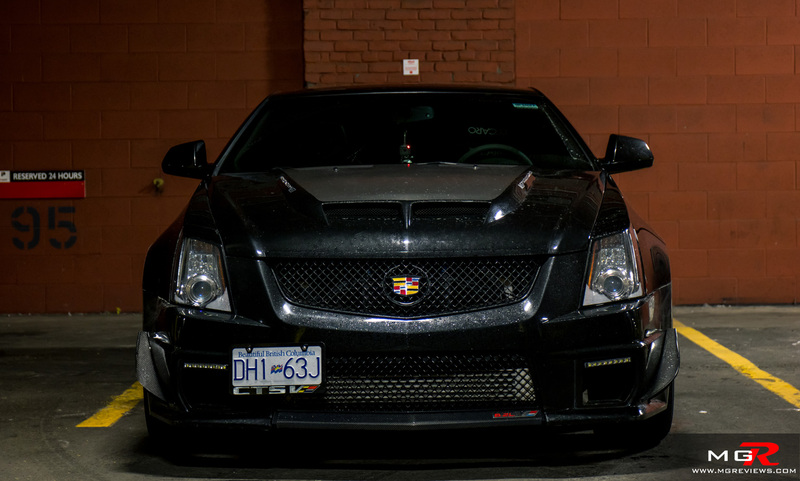 Overall this generation of the Cadillac CTS-V Coupe was the first step for General Motors and Cadillac in the right direction. It is a stylish coupe with an abundance of power but still staying true to the luxury aspect of Cadillac. Thank you to the owner for the opportunity to drive and photograph the vehicle.